3-Hydroxypropionic acid (3-HP) is one of the top value-added chemicals that can be produced from renewable resources. Crude glycerol, a cheap feedstock, is the foremost by-product generated from biodiesel industries. In this study, Klebsiella pneumonia was engineered for efficient 3-HP production from glycerol. Three metabolically engineered K. pneumoniae strains were constructed and the strain JJQ02 (ΔldhAΔdhaT) overexpressing aldehyde dehydrogenase from E. coli was the most suitable for 3-HP production. This strain produced 61.9 g/L of 3-HP (a yield of 0.58 mol/mol) in 38 h in a 5-L fermentor by control of the aeration rate. Deletion of ldhA and dhaT effectively eliminated lactate formation and reduced 1,3-propanediol production, but more 2,3-butanediol was accumulated due to redox balance. The fed-batch process was successfully scaled-up in a 300-L bioreactor where the 3-HP production level was 54.5 g/L (a yield of 0.43 mol/mol) in 51 h.
Deficiency of both lactate dehydrogenase and 1,3-propanediol oxidoreductase as well as control of aeration significantly enhanced 3-HP production, and the successful scale-up of the fed-batch process in a 300-L bioreactor indicated a great potential to industrial production of 3-HP. 3-Hydroxypropionic acid (3-HP), one of the top value-added chemicals produced from renewable resources (Werpy et al. 2004), has wide industrial applications, especially for the manufacturing of chemical derivatives including acrylamide, acrylic acid, 1,3-propanediol, malonic acid, methyl acrylate, ethyl 3-HP, propiolactone and acrylonitrile (Zhang et al. 2004; Kumar et al. 2013a; Gokarn and Minneapolis 2007). There is multitude of chemical routes for the synthesis of 3-HP (Kumar et al. 2013a), but chemical synthesis of 3-HP presents several drawbacks due to problems associated with high cost and the length of production time. Nowadays, researchers are paying much more attention to the biotechnological production of 3-HP because fermentation process is environmentally friendly, energy and time saving, and economically feasible. Biotechnologically, 3-HP can be produced by Klebsiella pneumoniae and Escherichia coli either from glucose or glycerol. It is well-known that crude glycerol is the foremost by-product generated from the biodiesel industries (Silva et al. 2009; Johnson and Taconi 2007; Plácido and Capareda 2016), and as a cheap feedstock, the use of glycerol as the carbon source is extremely attractive. By overexpressing dhaB and gdrAB of K. pneumoniae as well as an aldehyde dehydrogenase mutant of Cupriavidus necator, Chu et al. (2015) has achieved a 3-HP concentration of 71.9 g/L, which is the highest titer for recombinant E. coli. Requirement of vitamin B12 supply is the main drawback of using E. coli. Combining overexpression of puuC and optimization of metabolic flux, Li et al. (2016), has successfully achieved the highest titer of 83.8 g/L 3-HP in K. pneumoniae as well. 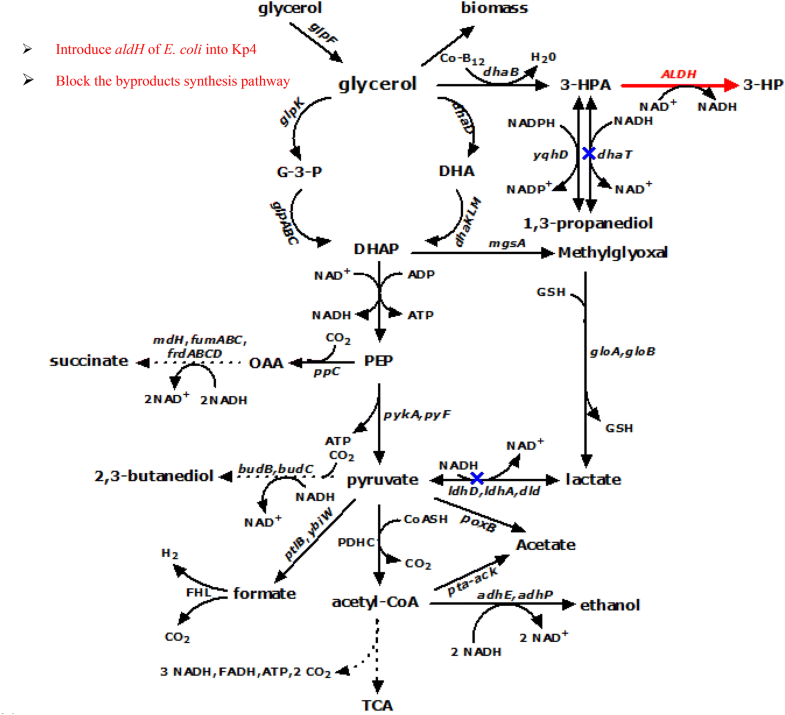 K. pneumoniae can efficiently metabolize glycerol and grow rapidly on glycerol under both aerobic and anaerobic conditions (Ruch and Lin 1975), and it is a producer of 1,3-propanediol. Thus, it is a good candidate for 3-HP production from glycerol. In K. pneumoniae, glycerol is metabolized by the dha regulon which governs glycerol oxidation and reduction pathways in parallel (Fig. 1) (Ruch and Lin 1975). In the oxidative pathway, the oxidation of glycerol is catalyzed by glycerol dehydrogenase (GDH), which leads to the formation of dihydroxyacetone (DHA), and at the same time, NADH is generated. Then DHA enters glycolysis and is further converted to various products such as lactate, ethanol and acetate through pyruvate metabolism. In the reductive pathway, glycerol is metabolized in two steps to generate 1,3-propanediol, first by dehydration to 3-hydroxypropionaldehyde (3-HPA) by a coenzyme B12-dependent glycerol dehydratase (DhaB), then by reduction of 3-HPA to 1,3-propanediol by 1,3-propanediol oxidoreductase (DhaT), and NADH formed in the oxidative route is consumed. 3-HPA can also be converted to 3-HP by aldehyde dehydrogenase (ALDH), and this reaction competes 3-HPA with that to form 1,3-propanediol. Wild-type K. pneumoniae produces no or very little 3-HP, therefore, 3-HP production largely relies on the activity of ALDH, and insufficient supply of the cofactor NAD+ also limits 3-HP production. Regeneration of NAD+ is a critical factor for enhancing 3-HP production, and NAD+ should be effectively regenerated for continuous 3-HP production (Niu et al. 2017). Other advantages of using K. pneumoniae are its abilities to synthesize vitamin B12 and to reactivate the inactivated DhaB due to the dehydration reaction. Therefore, we considered K. pneumoniae as the organism to produce 3-HP from glycerol. However, there are several factors that negatively affect the efficient 3-HP production in recombinant K. pneumoniae. Indeed, when high production of 3-HP is needed, minimization of by-product formation must be taken into account. Previously we have investigated simultaneous production of 3-HP and 1,3-propanediol in K. pneumoniae expressing ALDH from E. coli (Huang et al. 2012, 2013). Formation of 1,3-propanediol results in reduced 3-HP titer and increased difficulty to recover 3-HP. Furthermore, lactate is a major by-product that significantly reduces the 3-HP yield. In the present work, the genes dhaT and ldhA encoding 1,3-propanediol oxidoreductase and lactate dehydrogenase in K. pneumoniae were deleted to reduce the formation of by-products 1,3-propanediol and lactate. The ∆dhaT ∆ldhA double-mutant (JJQ02) overexpressing aldH of E. coli produced 61.9 g/L of 3-HP in fed-batch fermentation carried out in a 5-L bioreactor, and the fed-batch process was subsequently successfully scaled-up in a 300-L bioreactor. The bacterial strains and plasmids used in this study are listed in Table 1. The strain K. pneumoniae Kp4, a counterpart of Kp3, was obtained from K. pneumoniae ATCC10280 by multiple rounds of UV-irradiation and selection for 1,3-propanediol efficient production. Mutant strains lacking ldhA and dhaT genes were generated using the λ-Red-mediated recombination (Wei et al. 2012). The ldhA disruption cassette aac(3)IV containing short homologous extensions and apramycin resistance gene was amplified from plasmid pMD18-T-2028/a (Wei et al. 2012) using the primer pair ldh-s1 and ldh-a1. The PCR product was electrotransformed into Kp4 which had transformed with plasmid pDK6-Red and cultured in LB medium with 0.7 mM EDTA and 0.8 mM isopropyl-β-d-thiogalactopyranoside (IPTG). The transformants with homologous recombination in Kp4(pDK6-Red) were selected from LB plate supplemented with apramycin and kanamycin to obtain Kp4ΔldhA(apr)(pDK6-Red) strains. To eliminate the auxiliary plasmid pDK6-Red, Kp4ΔldhA(apr)(pDK6-Red) was cultured in LB medium with 0.5 mM SDS, and then diluted and plated onto solid LB (without antibiotic addition), and cultured overnight at 42 °C. The single colony which appeared on the LB plate but did not show kanamycin resistance was chosen, and the obtained Kp4ΔldhA(apr) strain was designated as JJQ01. To eliminate the apramycin resistance gene for further dhaT knockout, the auxiliary plasmid pDK6-Flp (Wei et al. 2012) was electrotransformed into JJQ01, and was cultured in LB medium with 0.7 mM EDTA and 0.8 mM IPTG. The resultant mutant with homologous recombination which was sensitive to apramycin, but resistant to kanamycin was selected from LB plate to obtain Kp4ΔldhA(pDK6-Flp) strain. The auxiliary plasmid pDK6-Flp was lost in the way similar to the method to eliminate pDK6-Red. Finally, strain Kp4ΔldhA was obtained for further dhaT knockout. Deletion of dhaT was performed with similar genetic manipulations in ldhA knockout according to the schematic diagram shown in Additional file 1: Figure S1. The strain Kp4ΔldhAΔdhaT(apr) was obtained and designated as JJQ02. Strains Kp4(pUC18-kan-aldH), JJQ01(pUC18-kan-aldH) and JJQ02(pUC18-kan-aldH) were generated by transforming Kp4, JJQ01 and JJQ02 with pUC18-kan-aldH, respectively. The basic culture medium for DNA manipulations was the Lysogeny Broth (LB), which contained (per liter): yeast extract 5 g, tryptone 10 g, and NaCl 10 g. The seed culture medium was (per liter): MgSO4·7H2O 0.5 g, yeast extract 3 g, glycerol 20 g, sodium citrate 0.42 g, KH2PO4 2 g, K2HPO4 1.6 g, NH4Cl 5.4 g, and trace element solution 1 mL; pH was adjusted to 7.0 with NaOH. The trace element solution contained (per liter): FeCl3·6H2O 5 g, MnCl2·4H2O 2 g, ZnCl2 0.684 g, CoCl2·6H2O 0.476 g, CuCl2·2H2O 0.17 g, H3BO3 0.062 g, Na2MoO4·2H2O 0.005 g, and HCl (37%) 10 mL. The fermentation medium was the same as the seed culture medium except that the concentrations of yeast extract and glycerol were 2 and 40 g/L, respectively. The inoculum was prepared in two 500-mL Erlenmeyer flasks containing 150 mL medium and incubated at 37 °C and 220 rpm for 10 h. Fed-batch fermentation experiments were carried out in a 5-L bioreactor (NCBIO, Shanghai, China) with a working volume of 2.2 L. The fermentation temperature was 37 °C, and the pH was maintained at 7.0 by automatically adding a solution of NaOH (5 M). The two-stage aeration was also adopted in fermentation process. The agitation speed was 450 rpm, and the all initial aeration rate was 2.2 L/min. To avoid substrate inhibition and substrate limitation, the glycerol concentration was maintained between 15 and 25 g/L. When the glycerol concentration was lower than 15 g/L, pure glycerol (AR grade) was added to the fermentation system. The fed-batch fermentation experiment was also carried out in a 300-L bioreactor (NCBIO, Shanghai, China) with an initial working volume of 150 L. The medium and basic operations in the 300-L bioreactor were the same as those conducted in the 5-L reactor, except for the stir speed and aeration rate, which were performed in reference to the dissolved oxygen profile obtained in the 5-L reactor. Cell growth was monitored by measurement of the optical density at 650 nm (OD650) of appropriately diluted sample with a UV–visible spectroscopy system (Xinmao, Shanghai, China). The residual glycerol concentration was measured every 2 h with an iodometric titration method (Jurecek 1957). The metabolites, including 3-HP, 1,3-propanediol, 2,3-butanediol, ethanol, succinic acid, lactic acid, acetic acid and formic acid were determined by a high performance liquid chromatography (HPLC) system (Shimazu, Kyoto, Japan) equipped with an organic acid analysis column (Aminex HPX-87H, 300 × 7.8 mm, Bio-Rad, USA), a refractive index detector (SPD-20A) and a UV/Vis detector (SPD-20AV). The mobile phase was 2.5 mM H2SO4 at the flow rate of 0.5 mL/min, and the column temperature was 50 °C. All samples were filtered through membrane filters with 0.22 μm pore diameter before injection. In the production of 1,3-propanediol or 3-HP from glycerol, lactic acid is the major by-product which significantly reduces the product yield. Therefore, attempts have been made to reduce lactate production by deletion of the gene encoding lactate dehydrogenase (Kumar et al. 2013b; Zhong et al. 2014). Since both the reactions forming 1,3-propanediol and 3-HP compete for their common substrate 3-hydroxyaldehyde (3-HPA), deletion of propanediol oxidoreductase favors 3-HP production (Ashok et al. 2011). Therefore, in this study, genes ldhA and dhaT were knocked out to enhance 3-HP production. The ldhA deficient strain JJQ01 was constructed and the knockout of ldhA was confirmed as shown in Figure S2A. The recombinant strains Kp4(pUC18-kan-aldH) and JJQ01(pUC18-kan-aldH) were constructed and fed-batch fermentations were carried out in the 5-L bioreactor. The profiles of cell growth, glycerol consumption and metabolites production are shown in Fig. 2a, b. Kp4(pUC18-kan-aldH) produced 18.3 g/L of 3-HP with a yield of 0.21 mol/mol in 38 h, while lactic acid reached 32.2 g/L with a higher yield of 0.34 mol/mol. In addition, 17.6 g/L 2,3-butanediol, 6.1 g/L of 1,3-propanediol and 10.7 g/L of acetic acid were produced. Formation of lactate increases not only the cost, but also the difficulty to recover 3-HP, which is an isomer of lactate. Furthermore, lactate is a main inhibitor of 3-HP and 1,3-propanediol biosynthesis (Xu et al. 2009b; Kumar et al. 2013b). Deficiency of ldhA effectively eliminated lactate formation and the 3-HP production achieved 48.3 g/L with a yield of 0.28 mol/mol, as shown in Fig. 2b. The concentration and yield of 3-HP in this ldhA deficient strain were enhanced by 1.64-fold and 33.3%, respectively, as compared to the Kp4(pUC18-kan-aldH) strain. Except the small amount of ethanol formation (around 4 g/L), the accumulation of pyruvate and formate by the ldhA mutant strain was not detected, which were almost not observed in the case of using wild-type strain. These results clearly indicated that blockage of lactic acid production greatly redirected the carbon flux to 3-HP production. 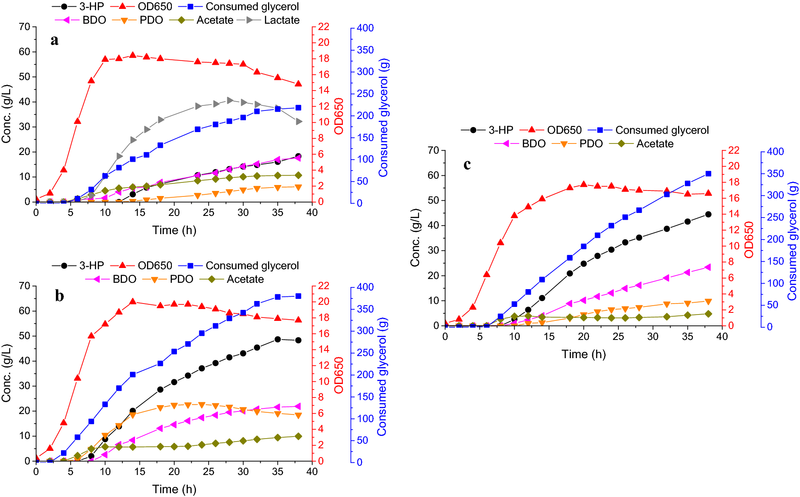 Glycerol assimilation through DhaB was significantly improved, almost 0.4 mol/mol of glycerol was directed through DhaB to 3-HPA, which was consistent with other studies (Kumar et al. 2013b; Xu et al. 2009b). Reduction of lactate could lower the toxicity to cells, favored cell growth and the productivity of 3-HP. However, reduction of lactate also enhanced 2,3-butanediol and 1,3-propanediol formation, which reached 21.9 g/L with a yield of 0.13 mol/mol and 18.5 g/L with a yield of 0.12 mol/mol, respectively. Because of ldhA deletion, excess NADH derived from increased 3-HP accumulation might promote production of 2,3-butanediol and 1,3-propanediol instead of lactate to regenerate NAD+ and keep redox balance. In fact, formation of ethanol also supported NAD+ regeneration, which resulted higher flux from pyruvate to ethanol than the flux to pyruvate. Deletion of ldhA dramatically boosted 3-HP production, at the same time, 1,3-propanediol production was also enhanced to 18.5 g/L. Ko et al. (2017) reported that 43 g/L of 3-HP and 21 g/L of 1,3-propanediol were obtained by reducing acetate and other by-products. Although 1,3-propanediol formation benefits glycerol utilization by regenerating cofactor, it accounts for a substantial portion of glycerol carbon flux. Since 1,3-propanediol and 3-HP compete for the same precursor 3-HPA, to limit the flux to 1,3-propanediol, the ldhA and dhaT double-knockout strain (shown in Additional file 1: Figure S2B) JJQ02(pUC18-kan-aldH) was constructed. The results of fed-batch fermentation in the 5-L reactor are shown in Fig. 2c. Unexpectedly, concomitant ldhA and dhaT knockout only resulted in 44.5 g/L of 3-HP, even though the yield was increased to 0.32 mol/mol glycerol. The deletion of dhaT resulted in reduced 1,3-propanediol titer and yield to 9.9 g/L and 0.07 mol/mol, respectively. But 1,3-propanediol was still produced in the reaction catalyzed by YqhD and other oxidoreductase (Ashok et al. 2013). Furthermore, compared to JJQ01(pUC18-kan-aldH), 2,3-butanediol production was increased from 21.9 to 23.4 g/L slightly, indicating the flux to the 2,3-butanediol pathway was increased to consume the excess NADH derived from the ALDH catalyzed reaction. 1,3-Propanediol synthesis plays a key role in regulating the redox balance in K. pneumoniae. Within the oxidation pathway, formation of one molecule of acetate from glycerol produces three molecules of NADH, at the same time one molecule of ATP is formed. Consequently, deletion of both ldhA and dhaT greatly reduced the ability of NAD+ regeneration, and more NADH was oxidized through 2,3-butanediol formation, resulting in increased 2,3-butanediol. Reducing the aeration rate (limiting oxygen supply) could enhance acetate production to provide more ATP, but at the same time more NADH was formed, resulting in further increased 2,3-butanediol production. However, the regenerated NAD+ seemed to be less than that formed in the reaction catalyzed by DhaT, leading to lower 3-HP production. Therefore, supply of suitable amount of oxygen to generate NAD+ without affecting DhaB activity and glycerol dissimilation is critical to 3-HP production in micro-aerobic fermentation. In this study, it has failed to improve 3-HP by deleting dhaT gene. 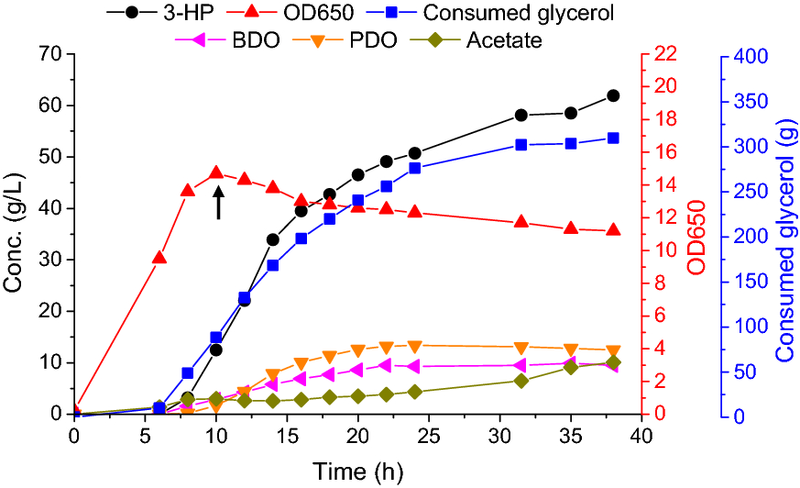 The glycerol dissimilation is regulated by glycerol dehydrogenase DhaD, glycerol kinase GlpK, glycerol dehydratase DhaB and 1,3-propanediol oxidoreductases 1,3-PDORs. 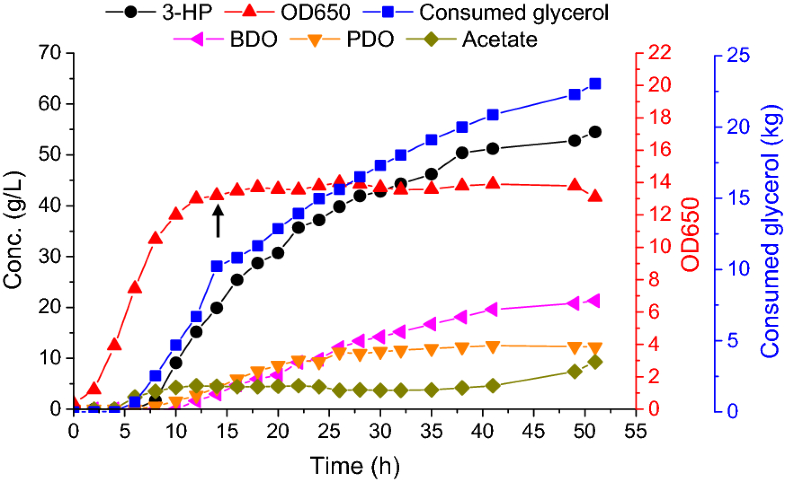 The rigidity of the glycerol branch point implies that improvement of the 3-HP production by deletion genes involved in the glycerol flux partitioning is difficult. Ashok et al. (2011) had determined the inherent activities of DhaD, DhaB, ALDH and 1,3-PDORs after deleting dhaT gene. They found that the activity of DhaD was slightly improved, the activity of ALDH slightly decreased, and the activity of DhaB significantly decreased. Zhang et al. (2008) also analyzed the robustness at branch points of glycerol dissimilation pathway. It was shown that partitioning of carbon flux between the reductive and the oxidative branch was robust against environmental conditions. Our previous studies showed micro-aerobic condition was favorable to 3-HP production. Compared to the anaerobic process, in the micro-aerobic fermentation 3-HP production was significantly enhanced due to higher expression level of aldehyde dehydrogenase, and at the same time, 1,3-propanediol production was reduced (Huang et al. 2013). Wang et al. (2011) reported that the specific activity of glycerol dehydratase in K. pneumoniae at an aeration rate of 0.04 vvm was 59% higher than that in the absence of air supply. But, it has been reported that glycerol dehydratase can be rapidly inactivated by oxygen (Toraya 2000; Ruch and Lin 1975), and affected 3-HP production significantly (Xu et al. 2009a; Huang et al. 2013; Niu et al. 2017). Additionally, coenzyme B12, the cofactor for DhaB, is not sufficiently synthesized under high aeration conditions in most of the natural 3-HPA producers such as K. pneumoniae. Huang et al. (2013) and Ko et al. (2017) also showed that highly aerobic conditions were not beneficial for 3-HP production. Therefore, we undertook preliminary fed-batch experiments under different aeration conditions and also found that maintaining a high aeration rate was unfavorable for 3-HP production after cell growth ceased (data not shown). In fed-batch culture of JJQ02(pUC18-kan-aldH), we adopted an aeration rate half the initial rate when the OD650 was closed to the maximum value. The profiles of growth, glycerol and metabolites are shown in Fig. 3, and the black arrow indicated the time point to lower the aeration rate (0.5 vvm). The final titer of 3-HP reached 61.9 g/L with a yield of 0.58 mol/mol in the 5-L reactor in 38 h. The 3-HP concentration and yield by JJQ02(pUC18-kan-aldH) were 3.3- and 2.76-fold than those by Kp4 (pUC18-kan-aldH), and 1.28- and 2.07-fold than those by JJQ01(pUC18-kan-aldH). The results showed that the production of both 1,3-propanediol and 2,3-butanediol stopped at 20 h. However, the titer of 3-HP kept increasing though the production rate decreased from this time point. In the later part of micro-aerobic fermentation, although little NADH was regenerated through formation of 1,3-propanediol and 2,3-butanediol, some NADH could still be regenerated through the electron transport chain, because the most efficient way to regenerate NAD+ is via the electron transport chain in the presence of oxygen (Richardson 2000; Kumar et al. 2013b), resulting the increase in 3-HP without obvious increase of 1,3-propanediol and 2,3-butanediol. To examine the feasibility of strain JJQ02(pUC18-kan-aldH) for 3-HP production in a larger bioreactor, fed-batch fermentation was carried out in a 300-L bioreactor following the fermentation conditions established in the 5-L fermentor. Two-stage aeration strategy was adopted; aeration rate was lowered to half in the time point of black arrow as shown in Fig. 4. 3-HP achieved 54.5 g/L with a yield of 0.43 mol/mol, and the concentration and yield were 12.2 g/L and 0.11 mol/mol for 1,3-propanediol, 21.3 g/L and 0.17 mol/mol for 2,3-butanediol, and 9.3 g/L and 0.11 mol/mol for acetate in 51 h (Fig. 4). Compared with the results obtained in the 5-L reactor, the titer and molar yield of 2,3-butanediol in the 300-L reactor were obviously increased, which were similar to those with the same strain in the 5-L reactor at a constant aeration rate of 1 vvm. It implied that the oxygen transfer in the 300-L reactor might be somewhat higher than that in the 5-L reactor with reduced aeration rate because some researches have indicated that production of 2,3-butanediol requires suitable aeration rate (Cheng et al. 2004; Shi et al. 2014; Xu et al. 2014). 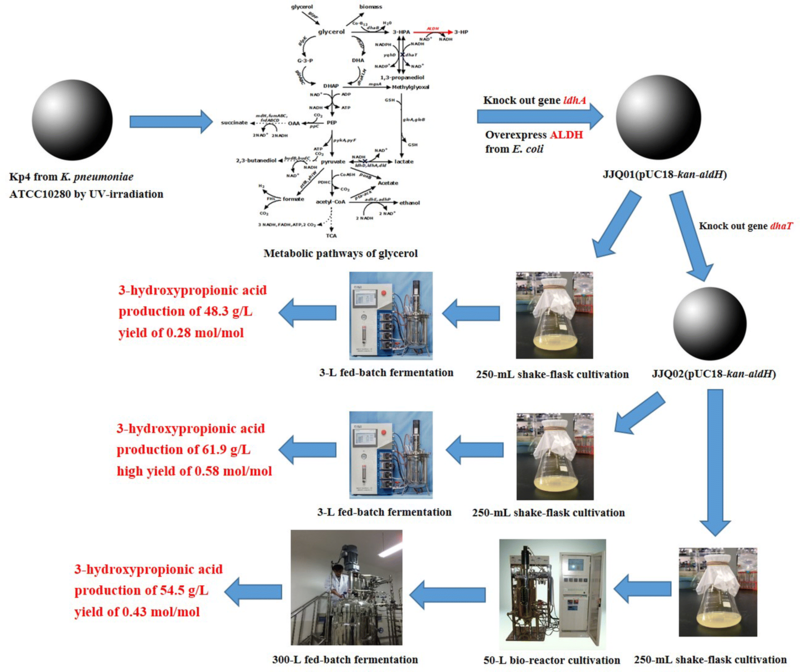 Under the aeration condition in the 300-L reactor, expression of the enzymes related with 2,3-butanediol formation and the NADH pool or NADH/NAD+ ratio promoted 2,3-butanediol production, and the expression of DhaB and AldH might be slightly affected. With a view to redox balance, in the ldhA dhaT double-mutant strain, NADH formed in the reaction catalyzed by ALDH was partly regenerated through the formation of 2,3-butanediol and other reduced metabolites such as ethanol and succinate, and partly by the electron transport chain (Richardson 2000; Kumar et al. 2013b). Therefore, the aeration rate in the micro-aeration fermentation significantly affected the end products. In fermentation in the 300-L reactor, although the aeration rate was reduced to half of the initial one, the oxygen transfer situation might still differ greatly from that in the 5-L reactor due to the different oxygen transfer characteristics, which was a traditional topic in bioprocess scale-up. The differences in products distribution in different reactors indicated the importance of precise control of oxygen supply, while only reducing the aeration rate seemed too roughly. However, although the 3-HP titer and yield differed slightly from those in the 5-L reactor, the scale-up was successful. Since the performance of oxygen transfer in the 300-L reactor was different from that in the 5-L reactor, it was expected that further precise regulation of the aeration rate in 300-L reactor could enhance the 3-HP level. In this study, three metabolically engineered strains were constructed and used to investigate the role of some key enzymes involved in 3-HP formation in a 5-L bioreactor. Through these experiments we confirmed, the ldhA dhaT double-mutant strain expressing aldH from E. coli was able to achieve a high titer of 3-HP with a commendable yield using glycerol as the carbon source. In addition, a two-stage aeration strategy was effective to 3-HP production. Using the strain JJQ02(pUC18-kan-aldH), two-stage fed-batch fermentation was performed and 3-HP reached 61.9 g/L with a yield of 0.58 mol/mol. The scale-up experiment was also conducted. The present findings give useful insights into the metabolic engineering of K. pneumoniae for industrial production of 3-HP. JJ and BH performed the experiments and analyzed the data. HW, ZL and QY conceived and designed the experiments. JJ wrote the paper. HW, ZL and QY revised the manuscript. All authors read and approved the final manuscript. All authors read and approved the final manuscript. The work was also indebted to Dr. Jian Hao (Shanghai Advanced Research Institute, Chinese Academy of Sciences) to support the plasmids. This study was supported by the Fundamental Research Funds for the Central Universities (Grant Nos. 222201313007, 22A201514042, 22221818014), the National High Technology Research and Development Program of China (Grant Nos. 2012AA022104, 2012AA021205), Partially Supported by Open Funding Project of the State Key Laboratory of Bioreactor Engineering. 40643_2018_218_MOESM1_ESM.docx Additional file 1: Figure S1. λ-Red-mediated recombinase assisted gene replacement for dhaT knockout in Klebsiella pneumoniae. Figure S2. A. Confirmation of ldhA deletion in Kp4 by single colony PCR. M, DL2000 Marker; 1, wild-type Kp4 at 2221bp; 2-5, Kp4 ΔldhA::apr at 2773bp. B. Confirmation of dhaT deletion in JJQ01 by single colony PCR. M, DL2000 Marker; 1, wild-type Kp4 at 2642bp; 2-4, Kp4ΔldhAΔdhaT::apr at 2847bp.